After weeks of facing difficulty in sending her kids to school, a Pune-based mum took it upon herself to construct a viable road. Along with a few other residents of Baner and Balewadi in Pune, she not only ordered the raw materials and the road levelling machinery, but also got down and joined hands to do the actual work. Talking about her inspiration to a leading daily she said, "We have done this for our children who have been suffering because of the poor condition of the road. My vehicles too have suffered from it. There are many who come on two-wheelers and walk all the way to the school. The least they deserve is a levelled road. It was all about getting everyone together." 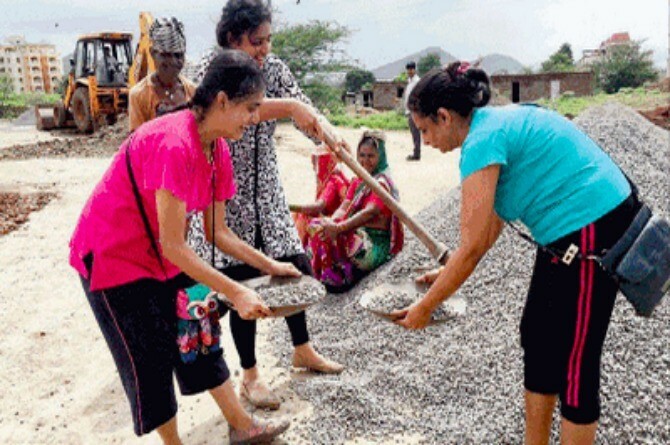 Her initiative attracted fellow residents to join her in building a road that the even Pune Municipal Corporation (PMC) had refused to touch. The residents had previously made many unsuccessful attempts to get the civic authorities to construct the 500-odd metres of road. In fact, they even reached out to the PM and Union ministers through a series of tweets and mails, but got no response. And that's when the mother (who wants to remain anonymous) decided to construct the road herself. Several parents who joined the mother in constructing the road spoke to a daily and described their happiness at their achievement. Parent Jaya Chandra was quoted as saying, "Taking such a step really needs courage and willingness to work for society. This initiative is proof that one small step is the key to a bigger movement. I am doing it for my kids to teach them the valuable lesson that a single person can lead by taking a small step. When tomorrow morning they will see the changed road to their school, they will be happy to know that it's their parents' contribution." Participating in the 'shram daan' was also a senior citizen, Shwetambari Shetye. She said, "The PMC has been spending crores of rupees to break down fully functional roads to concrete them. It is shocking that they could not help make just a basic, levelled approach road for our children to go to school. It used to pain us to hear our children complaining of their heads banging against the seat in front of them when travelling over the bumpy patch. Now, we feel proud and happy to be associated with this social movement." The efforts of these mothers and senior citizens only goes on to prove an important lesson, "God helps those, who help themselves." It is a lesson all these parents would be teaching their children, with their exemplary work. Three cheers for these amazing parents! Please leave your comments in the box below. Check out theAsianparent Community for more insightful parenting tips. Like us on Facebook and follow us on Google+ and Twitter to stay up-to-date on the latest from theIndusparent.com!